SF Beer Week is a collection of events throughout the Bay Area celebrating craft beer and the craft beer community. 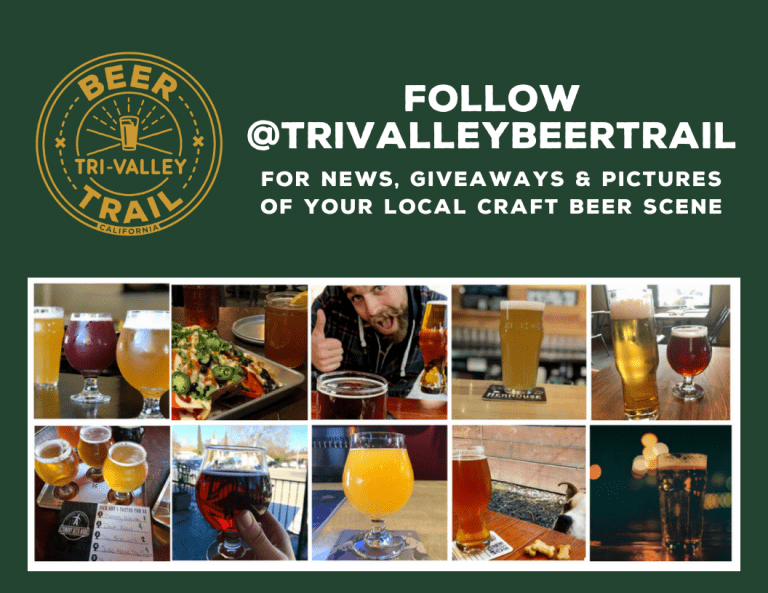 The Tri-Valley is a haven for beer-lovers and is incredibly proud of its own growing craft beer scene. Check out what all the buzz is about- here are the SF Beer Week events going on in the Tri-Valley February 1st – 10th! And of course don’t forget to download the Tri-Valley Beer Passport to start collecting stamps for prizes. Calling all beer experts (self-proclaimed or not), Beer Judging 101 is an official introduction to the critical tasting and describing of beer. Expand your evaluative, perceptive, and descriptive ability, while sampling some unique and world class beers. We’ll compare and contrast different beers, talking about the ingredients and processes that go into them, and discuss the resulting flavors, body and aromas in the beer. You will be shown how to approach a beer from a judge’s perspective, learning some practical tasting skills, as well as terms for discussing the various flavors, aromas and other attributes of the beer. Join Eight Bridges staff and patrons celebrate five years since their doors opened in Livermore, CA. Enjoy live performances by Timmy G and Blue House Band, and sip on an assortment of new beers, a few returning favorites, firkins, and a rotating NITRO tap. Chow down on a plate from Que Squared Barbeque truck from 2-8pm between beers. An extra perk – this brewery is dog-friendly, so feel free to bring along your furry friends! This is the fourth year McKay’s will be hosting Altamont, Faction, and Fieldwork breweries during SF Beer Week. All three will be bringing along some special SF Beer Week brews for you to try out. Each brewery will have reps in attendance. saturday FEb. 2nd | 4pm - supplies last | danville brewing co.
Country Malt Group and Danville Brewing teamed up to brew a pre-prohibition cream ale for the SF Beer Week Opening Gala, but we’re bringing it close to home here in the Tri-Valley. Midday Mellow features 100% Great Western Malt Pure Idaho Pilsner malt, and Yakima Chief’s new “Independence” hop for bittering, whirlpool and dry-hopping. Come by and chat with Danville’s GABF-medal winning brewmaster, Matt Sager, and Jonathan Plise from Country Malt Group to learn how that’s so and try this special brew. Join McKay’s Tap House for their SF Beer Week kick-off event! McKay’s will be welcoming their brew buddies from SoCal: Bottle Logic Brewing, Artifex Brewing Company, Unsung Brewing Company, and Chapman Crafted. Over 15 kegs will be tapped and guests will have a chance to purchase a limited quantity of bottles from Bottle Logic Brewing. Get there by 4pm to save your place in line for bottle purchases! Watch the big game while enjoying select beers from Riip Beer Co. & Central Coast Brewing. Beer Baron Bar & Kitchen in Pleasanton, CA will have all their normal brunch food options while featuring special beers and brewers from around California. Come kick off SF Beer Week at Range Life! This local favorite will be serving up a special 4-course menu complete with Henhouse Brewing Co. beer pairings. Check out their menu and reserve your spot with the button below! Enjoy your favorite dishes at Pacific Catch paired with Shadow Puppet brews! This awesome collaboration will include a 7 course dinner, beer pairings, and a quick lesson on identifying unique food ingredients that complement the nuances of craft beer. Experience Livermore’s growing craft beer scene among the bustling nightlife of Downtown Livermore. Join in as downtown restaurants, tap rooms, and other watering holes, showcase the beers of our city’s 4 Breweries. Altamont Beer Works, Eight Bridges Brewing, Shadow Puppet Brewing Company, and Working Man Brewing Company will be taking over the taps of Livermore Downtown. Food & money donations to the Alameda County Community Food Bank will be accepted at various locations throughout the night. McKay’s Taphouse will open their beer garden to Pure Project, Moonraker & Knee Deep Brewing for a special SF Beer Week feature. This brewery trifecta is a real treat, so come early before the kegs have kicked! Join BottleTaps for their special SF Beer Week Tap Takeover with Laughing Monk Brewery! Chef Patrick will be cooking up something delicious to pair with refreshing beverages brought in by Laughing Monk Brewery. Stay tuned for what they have in store for you with the link below. No need to pay bridge tolls for this trip to the North Bay… Three Sheets Craft Beer Bar is bringing beers “from the North” down for your drinking pleasure! Check out this awesome tap takeover featuring North Bay breweries including Sonoma Springs, Russian River, HenHouse, and Fogbelt. Brewers will be in the house from 6pm – 8pm! Three Sheets Craft Beer Bar will open their doors to these California favorites: Fieldwork & Fall Brewing. Enjoy special SF Beer Week selections from both breweries, play some corn hole, and kick back with friends. BottleTaps will be teaming up with Shadow Puppet Brewing Company for a Five Course Beer & Food Pairing! Enjoy five delicious beers as Chef Patrick pairs each glass with something tasty. Tickets include a five course dinner, beer pairings, and gratuity. Seats are limited, so get your spot soon! Yo won’t want to miss this. Beer Baron Bar & Kitchen in Pleasanton is hosting the largest tap takeover from Beachwood BBQ that the Bay has ever seen. This special tap-list features over 18 Beachwood BBQ beers, and the Brewers will be on site for most of the evening. Join Eight Bridges Brewing as they celebrate a new year and welcome a brand new IPA to the menu! Eight Bridges brewed 19 new and unique IPAs during 2018 and they’re kicking 2019 off with another new one. Besides 12 taps of delicious beer, grub down with P&J’s Waffle Delight food truck serving food starting at 2pm. Enjoy live performances by Better Days from 5:30 – 8:30pm. McKay’s will be hosting local favorites: Lizzy D’s Bakery and Shadow Puppet Brewing Company, as well as featuring High Water Brewing and Sonoma Springs Brewing Company for another intoxicating day of some of the Bay’s best cupcakes paired with some awesome brews.